Faced with continuing deadlock in the mega deal to acquire 126 French Rafale fighters, India is now pressing the throttle to seal the even bigger project with Russia for the FGFA. India is ready to seal a big project with Russia for the stealth fifth-generation fighter aircraft (FGFA), The Times of India wrote referring to the country’s defense ministry. "Faced with continuing deadlock in the mega deal to acquire 126 French Rafale fighters, India is now pressing the throttle to seal the even bigger project with Russia for the stealth fifth-generation fighter aircraft (FGFA)," the newspaper wrote. "India will overall spend around $25 billion on the FGFA project if it goes ahead with its plan to induct 127 such fighters, as earlier reported by TOI. Meanwhile, India is ready to forego the earlier plan for a 50:50 design and work-share agreement with Russia on its under-development FGFA called PAK-FA or Sukhoi T-50." The PAK FA - "Prospective Airborne Complex of Frontline Aviation" - is a fifth-generation fighter program of the Russian Air Force. 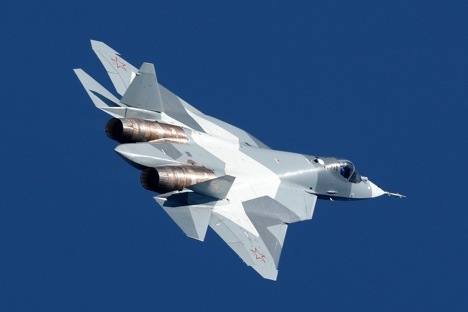 The T-50 is the aircraft designed by Sukhoi for the PAK FA program. The aircraft is a single-seat, twin-engine jet fighter, and will be the first operational aircraft in Russian service to use stealth technology. It is a multirole combat aircraft designed for the air superiority and ground attack functions. It combines supercruise, stealth, manoeuvrability, and advanced avionics to overcome previous generation fighter aircraft along with many ground and maritime defences. The PAK FA is intended to be the successor to the MiG-29 and Su-27 in the Russian Air Force and serve as the basis for the Fifth Generation Fighter Aircraft (FGFA) being co-developed by Sukhoi and Hindustan Aeronautics Limited (HAL) for the Indian Air Force. The T-50 prototype first flew on 29 January 2010 and production aircraft is slated for delivery to the Russian Air Force starting in 2016. The prototypes and initial production batch will be delivered with a highly upgraded variant of the AL-31F used by the Su-27 family as interim engines while a new clean-sheet design powerplant is currently under development. The aircraft is expected to have a service life of up to 35 years.